There are many books that deal with pregnancy and maternity, and a large number of magazines and articles on paediatric nursing that examine these subjects from different points of view. This volume is not a manual and is not intended to explain to future parents what to do and what to avoid. The objective is rather to look at the most significant and problematic aspects of this delicate phase of a woman's life and that of a couple. 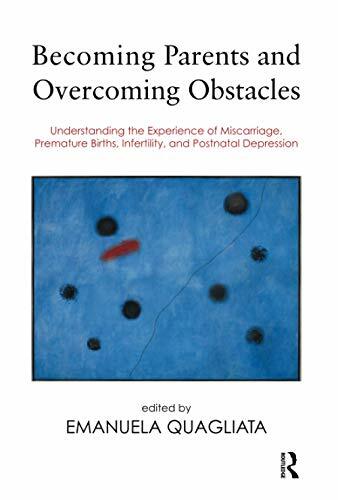 It seeks to offer a key to understand the deep significance and complexity of the path to follow to become parents and to face fears linked to the difficulty of procreation, using the tools of observation and psychoanalytic listening. Reviewing several experiences of clinical work, the authors offer reflections on the personal experiences of women and couples and the difficulties which can be met when the desire for a child is disappointed. A maternity and parenting project can be frustrated by miscarriages and encounter the fear of infertility. How are the problems of sterility or spontaneous abortion experienced? Emanuela Quagliata is a child psychotherapist and psychoanalyst and a member of the Italian Association for Psychoanaltyic Child Psychotherapy. She edited and contributed to 'Neonatici Visti da Vicino' (1993), and edited the earlier Italian version of this volume, 'Un Buon Incontro' (1994).